The Peter Pan Collar is a basic, rounded collar that sits flat against the neckline of a blouse. It is a classic style that can be used on something as modest as a schoolgirl blouse or as sophisticated as a satin evening blouse. 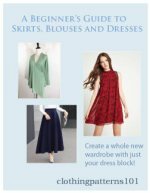 This simple neckline treatment is very easy to draft, easy to sew, and can be as large or as small as you'd like it to be. While the rounded front is the traditional look, you could also do a square, pointed shape at the front of the collar. Unlike a shirt collar, this style will not stand up against the neck, so even a square front version will still be a Peter Pan. This collar is very easy to draft. 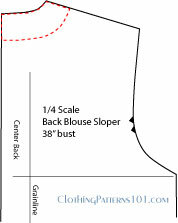 Simply follow the curve of the neckline (at whatever width you wish) and add a curve at the center front opening. A basic Peter Pan is about 2" wide. 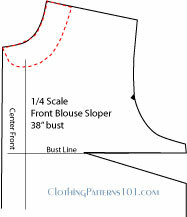 If you choose that width, draw a line 2" from the neck curve from the shoulder line almost to the front of the bodice. As you approach the center front, swing the curve up to the neckline. 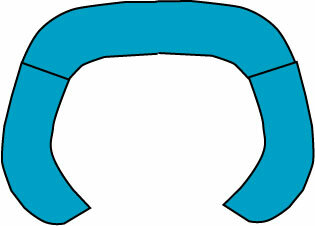 This creates your front collar shape. You can do this "by eye", drawing a shape that is pleasing to you. On the back, you will again follow the shape of the neckline, drawing a line 2" away from the neckline, from shoulder to shoulder. This collar may be any width you choose; it can be very small and dainty at about 1 1/4 - 1 1/2” wide, or it can make a bold statement at more than 2” wide. Use the collar on a crisp, white cotton blouse, or add a satin collar to a crepe blouse (with satin covered buttons) for evening wear. There is nothing schoolgirl about that! The collar is sewn with 2 ply of fabric (usually self-lined), and set by basting to the edge of the neckline. The neckline is then finished, typically, with bias tape (be sure to stitch your tape in place under the collar; so it is hidden) or a facing. 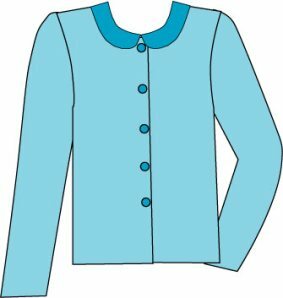 You'll find MUCH more information about collars and necklines in the in-depth tutorial, A Beginner's Guide to Necklines and Collars. 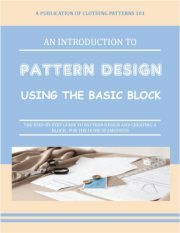 Learn to draft cowl necklines, shawl collars, stand collars, shirt collars, scoop necklines, squared necklines - and variations of all of these! Check out the Beginner's Guide to Necklines and Collars now!